Saturday, February 26 at 7 p.m.
Chamber music friends and fans can accomplish two goals on Saturday evening, February 26 at 7 p.m. You can hear a trio of wonderful young musicians, the Piacevole Piano Trio, and help support CMYS. Donations are $65 each and $120 for couples. The donations are tax deductible contributions to Chamber Music Yellow Springs. Refreshments will be served. This concert will be held in the intimacy of a private home, the way chamber music composers originally intended their music to be heard. Jim and Cammy Grote have graciously invited the trio and chamber music fans to their home at 260 Kingsfield Court, Yellow Springs. 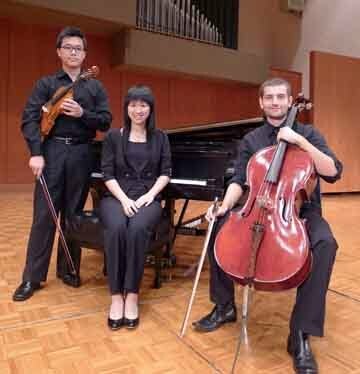 The Piacevole Piano Trio are advanced students of Professor Franklin Cox at Wright State University. They will perorm Mozart's Trio in Bb, K502 and Robert Schumann's Trio in D minor, Op. 63. You can call for reservations or order your tickets from Brown Paper Tickets.